If students watch a 10-minute, instructional video, all the information in the video goes into the watcher’s head. Right? A young physics educator from Australia is the latest entrant into the quest for the Holy Grail of Video-based Instruction. But, unlike some others, this physics educator is a scientist, so he carried out controlled studies. 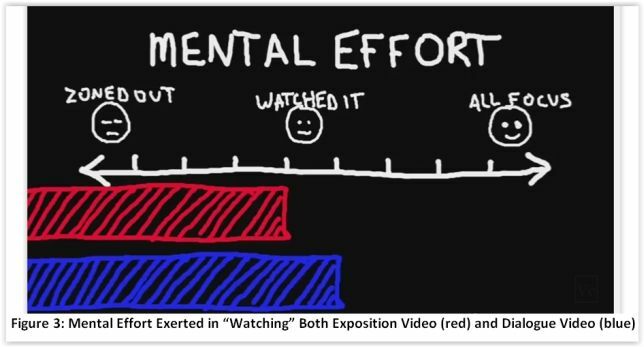 Cutting to the chase, what he found was this: Watching a video — a good video by standard measures —that informs students about physics concepts did not result in the students learning the physics concepts. Here’s a highly abbreviated version of the research studies that Derek Muller reported in his PhD dissertation and in subsequent publications. Before any instruction in physics, Dr. Muller showed students a video with several physics’ scenarios and asked the students a question about each of the scenarios. In Figure 1, once the ball is in the air, what force(s) are acting on the ball? they reported that they were highly confident in their answers. 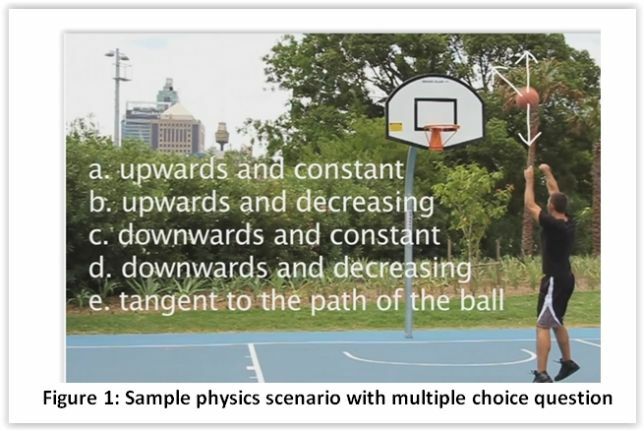 Science educators have observed that people, through their interactions with the physical world, develop all sorts of naïve theories and explanations for phenomena like how basketballs fly through the air. Unfortunately, many — if not most — of those theories and explanations are incorrect. The students, when watching Muller’s expository video, brought those misconceptions to that watching experience. Some students told Muller that they didn’t have to pay much attention during the video, since they already knew how situations like basketballs flying through the air worked. Indeed, the videos just bolstered the confidence that the students had in their initial, albeit incorrect, theories. Muller conjectured that if a new kind of video were made that addressed the students’ misconceptions explicitly, perhaps then students could get past their misunderstandings. So Muller conducted another experiment using the same problems and the same pre-test, but with a very different video. This time, Muller employed actors to play a typical student and a physics teacher. In this new video, the student talked about his misconceptions, giving the teacher a chance to offer correct physics explanations. After watching this video, the students took the test again. You can see their scores in the rightmost blue bar graph in Figure 2. 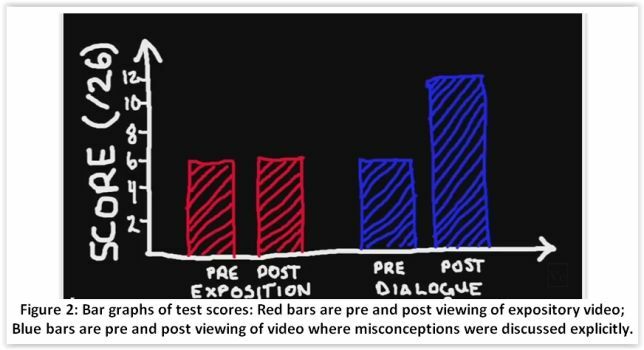 On this post-test, students’ scores just about doubled to almost 12 out 26.
the students’ reported expending more mental effort in watching the “dialogue” video (blue bar) than they did in watching the expository video (red bar). Muller concluded that those "clear," "concise" and "easy to understand" expository videos that abound in science education do not appear to be particularly effective in teaching science. By contrast, videos with dialogue that address the underlying misconceptions students bring to science seem to be more educationally effective. Putting his theory into practice, Muller has gone on to produce a series of science instructional videos, posted on YouTube, called “Veritasium.” Check them out!